The Portal Hunt Authoring Tool (PH AT) is a web-based application hosted at MyMultimediaWorld (http://www.MymultimediaWorld.com). 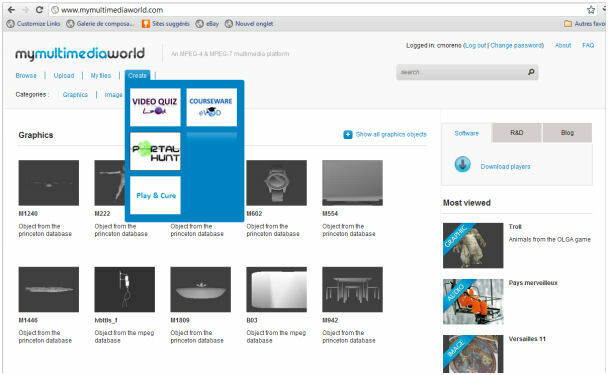 MyMultimediaWorld is a web-based public platform that offers a complete multimedia content diffusion service supporting images, 3D objects, videos, sound and games under the MPEG-4 format. More than showcasing MPEG technologies for media representation, compression, streaming, interaction, MyMultimediaWorld.com is a platform that offers APIs (Application Programming Interface) allowing the users to integrate their own extraction algorithms using the MyMultimediaWorld resources to create enriched content such as games and courseware, among others. The specificity of the PH AT is that the output is an MPEG-4 file that contains the entire game behavior and the corresponding media assets. The file can be visualized by using MPEG-4 compliant player. Internal decoding libraries made possible to transparently decode MPEG-4 supporting different resolutions.